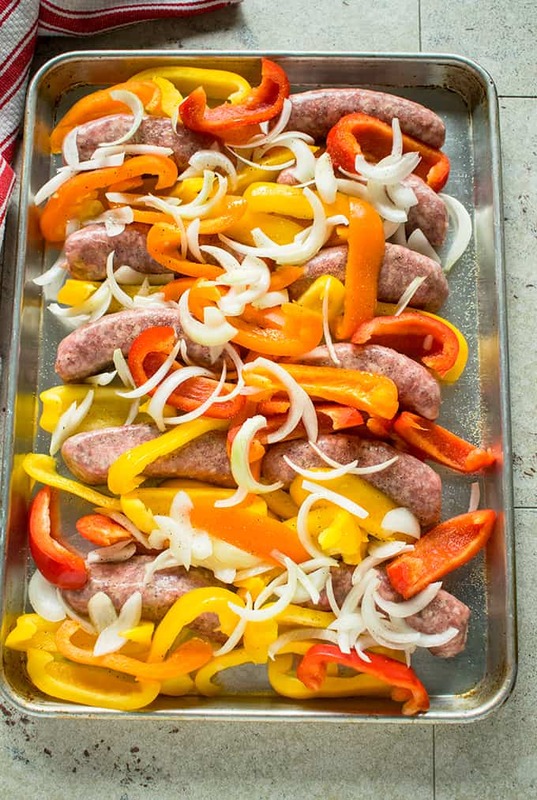 Roast these Easy Sausage and Peppers in the oven and you’ll never go back to making them on the stove! This is my go-to recipe that’s always a hit. A fantastic, sheet-pan dinner ready in under an hour. 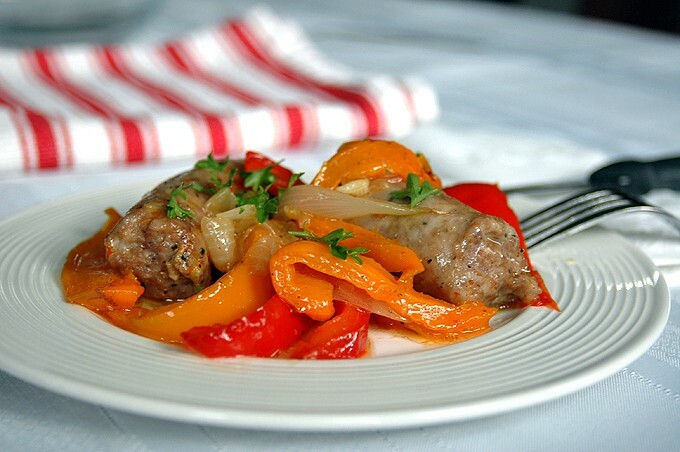 Are you still making Italian sausage and peppers on the stove? Because roasting them in the oven is where it’s at. 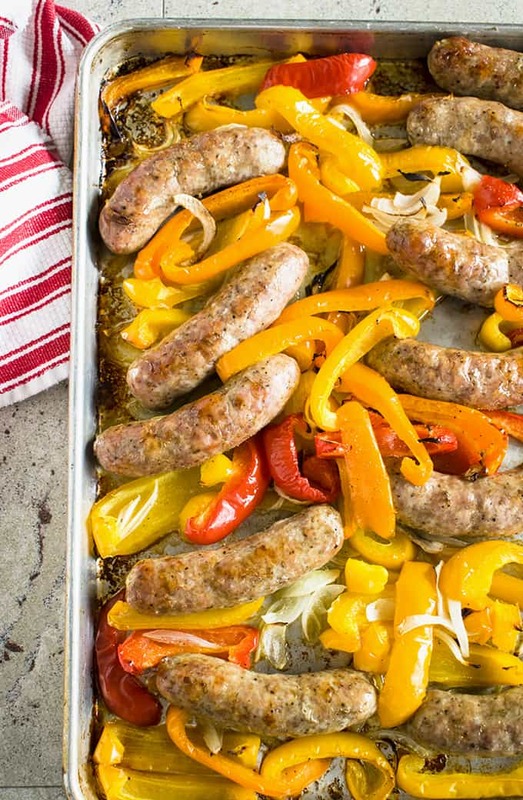 I’m talking juicy, browned sausage, caramelized onions and peppers and knock-your-socks-off flavor. With barely any effort. Ready in less than an hour. 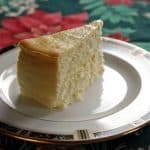 This is my go-to recipe I’ve been making for nearly 17 years. I decided I had no patience for the stovetop method and began experimenting with roasting sausage and peppers in the oven. I’ve now made this more than 120 times and get asked to bring it to parties. 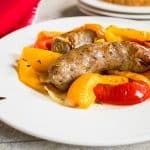 I first shared this Easy Sausage and Peppers recipe three years ago, soon after I launched Cooking with Mamma C. That night, I heard from four friends who’d each made it for dinner. They raved at the results. Their families were happy. This is a keeper, folks! I always use my favorite trio of bell peppers — red, yellow and orange. They’re more sweet than green peppers and look gorgeous. 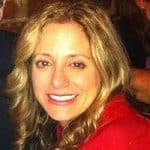 Yes, they’re more expensive, but look for them on sale. Add sliced peppers and onions, drizzle everything with olive oil, and add salt, pepper and garlic powder. Then you’ll bake it uncovered, turning over the sausage and stirring around the vegetables just past the halfway point. For parties, I cut each sausage in half for smaller portions and then bake everything at 375 degrees for 90 minutes. To accommodate large quantities, I use foil roasting pans. They don’t brown everything as well, but transferring the cooked sausage and peppers to a chafing dish with a flame underneath takes care of that. 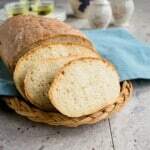 Whether you’re making this for a party or an easy weeknight meal, make sure you have fresh Italian bread on hand. (You’ve got to dip that bread in the oil!) Or serve the sausage and peppers on hoagies. And, definitely make enough for leftovers. They won’t freeze well, but they’ll be gobbled up within a few days anyway. Baked on pizza (cut up the cooked sausage and peppers first.) This Homemade Pizza Dough with Beer is the best! 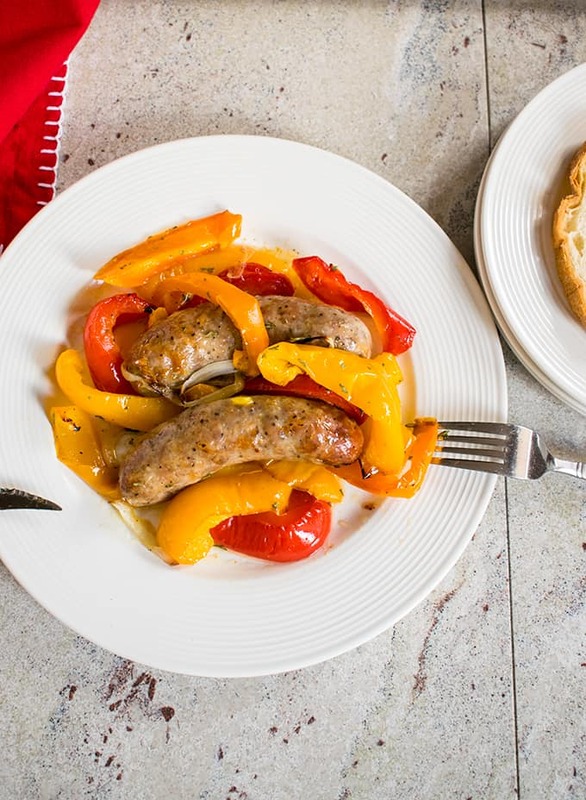 Friends, you need these Easy Sausage and Peppers in your life. 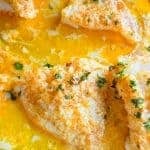 Whether you go fancy and serve this meal on diner plates with forks and knives, or tucked into sandwiches on paper dishes (with olive oil dripping down your chins after each bite), enjoy! 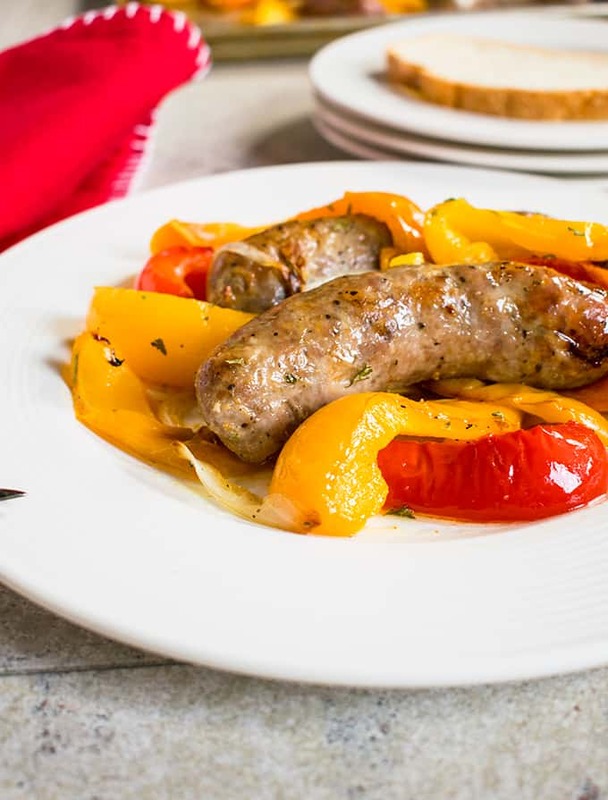 Watch the video to learn how to make Easy Sausage and Peppers! Preheat the oven to 400 degrees for a quicker dinner, or 375 degrees if you are cooking for a party. Spray a roasting pan with cooking spray. Prepare the peppers by rinsing and patting them dry with a paper towel. Cut a circle around the stems to remove them. Cut each pepper in half and remove the seeds and membranes. Cut the halves in half again. Then slice each one into strips about 1/2 inch wide. Prepare the onions by cutting off the ends, peeling off the skin, and cutting the onions in half. Then cut each half into vertical slices. If you are making the sausage for a party, cut each sausage in half horizontally to make smaller portions. Place the sausage in a single layer in the pan. Add the peppers, then onions. Drizzle olive oil on each row of sausage. Lightly sprinkle salt on each row. Then sprinkle on pepper and garlic powder, again being sure to season every row. Bake, uncovered. If using a 400-degree oven, bake it for 45-50 minutes total, turning over the sausage and stirring around the vegetables after 30 minutes. The sausage should be browned on the bottom before you turn it over. If using a 375-degree oven, bake for 90 minutes total, turning over the sausage and stirring the vegetables after about 50 minutes, again waiting for the sausage to brown on the bottom before turning it over. 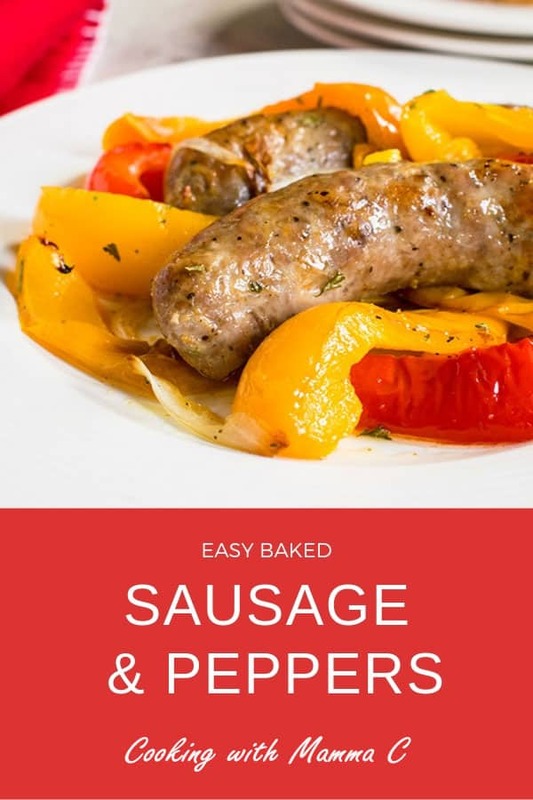 Since ovens vary, be sure to check on the sausage and peppers a couple of times during baking to see if you need to stir them around. Test for doneness by cutting a sausage in half. It should no longer be pink inside. 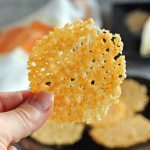 Serve with fresh Italian bread or on hoagies. Hi Sue – I’ve never used a rack with this.